Walsh PT, Hansell M, Borello WD, Healy SD. 2013. Are elaborate bird nests built using simple rules? Avian Biology Research 6(2):157-162. Abstract. Determining how animals achieve seemingly complex behaviours is central to our understanding of the evolution of cognition. Complexity in behaviour is itself not sufficient for confirming a role for learning and memory. For example, although the nests some birds build appear structurally complex, they may, like the structures built by ants and termites, be achieved through relatively simple building processes. We attempted to use observations of nest building by male Southern Masked Weavers to determine whether one aspect of nest building, the completion of a nest, could be described usefully by either of two rule-based explanations that explain the construction of complex physical structures by invertebrates. The first possibility, stigmergy, is that birds use feedback from local nest cues to determine the building sequence and nest completion. The second possibility is that birds follow a stereotypical series of behaviours. We found that male Southern Masked Weavers returned to work on apparently complete nests even when they had begun to build a new nest. Neither stigmergy nor stereotypy explains our observations of nest building behaviour in Southern Masked Weavers. If weaverbirds do complete their nests using a set of rules, those rules are not the simple ones that have been used to describe building by invertebrates. This leaves open the possibility that learning and memory play a greater role in nest building than is currently thought to be the case. 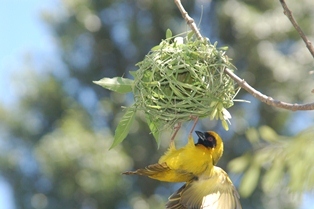 The nest building of 18 colour-ringed male Southern Masked Weavers was observed on Atholl Holme Farm, Gaborone, Botswana, between October and November 2008. The authors note that males increased their visits to old nests as they built more nests, and to more of those old nests, suggesting that males retained information about the number and location of nests that they have built as well as the status of the nests. Download a draft pdf of the paper here.